Everyone is a suspect at the dinner party, but who *is* the murderer ??? late 30's, doomed romantic hero nursing a broken heart and a bottle of whiskey. Suave, elegant and slightly battered. Countess Bogov - an exiled Russian aristocrat, glamorous and mysterious. Pierre Payanski - 24 year old half-Russian poet. Ingrid Pith - Danish art dealer - finds painting all over Europe. Pia Fedora - Spanish cabaret star and love of the Black Cat. 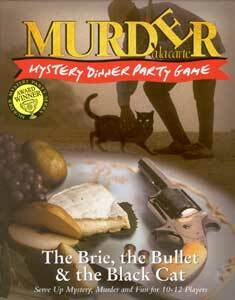 Each Murder Mystery Game includes party planner, recipes, music and decorating tips, character booklets including their roles, background and a few tasty secrets, place cards for each character, party invitations, 6 secret clues and a CD with an introduction, scene setter, summary of events and finally the solution to the crime.